Check out OSU's beermeister, Dr. Tom Shellhammer, and hopmeister, Dr. Shaun Townsend, on television! http://www.kval.com/news/local/89487982.html?tab=video The two titans of the Oregon academic beer scene discuss their quest to "add new scents to Oregon suds" (quote courtesy of KVAL's Todd Milbourn, and a good one!). Indie Hops is pleased to provide the seed money for this noble quest. Tom and Shaun are the perfect spokesmen for the new age of creative breeding and brewing. Goodness these two are lean, fit and poised! They exude the tranquility and clarity of an athlete who's just run 5 miles, or biked 50, cooling down with a refreshing, herbal and tose-tingling craft beer. 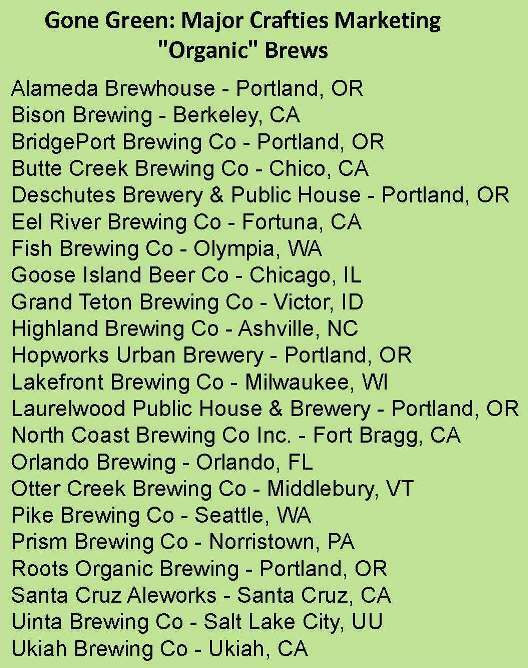 By the way, we appreciate the vote of confidence from the TV anchorman, but Indie Hops is brand new to the scene -- we can't yet lay claim to being the biggest hop merchant in Oregon! But our eyes are on the prize. Organic hops. Should we or shouldn’t we? The answer is: bring it on. Here’s why. We believe. We believe organic hops can be grown successfully. They can impart new and different flavors and aromas. They are good for the environment. And consumers will continue to give up more green for pure, green produce. All it takes is finding the right hop farmer. A farmer with confidence, curiosity, and stamina. A farmer who’s willing to experiment, to learn from failures, to get back on that tractor. A farmer who is “intrigued” by the enormous challenge of doing it the way of her ancestors and getting it right. We’ve found that farmer. Her name is Gayle Goschie of Goschie Farms. Since 2008, Gayle has been growing a few acres of organic hops on Goschie Farms, a venerated 350 acre hop farm in Silverton, Oregon. 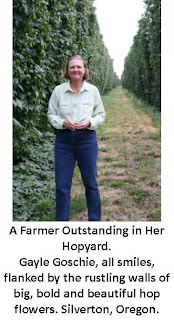 She’s been growing organic hops without forward contracts, a testament to her confidence as a grower and her faith that if she grows ‘em, a market will buy ‘em. Indie Hops is betting on both counts – that Gayle can deliver, and craft brewers will continue to demand US grown organic hops. We’re contracting with Goschie Farms, which obtained its organic certification in 2009, to put in 20 acres of organic hops. To put that number in perspective, figures vary, but last year it’s estimated that 75 acres were planted organic nationwide. It’s a risky bet. The rap on organic hops has been that they’re too expensive, their yields are too low, supplies of particular varieties haven’t been available, their quality is suspect and beer drinkers really don’t care. A bad rap, yes, but not entiredly deserved, and certainly fixable. Organic hops are more expensive than the inorganically grown kind. First, the acreage must be certified as free of residual synthetic chemicals. Second, without the use of conventional fertilizers, the grower needs to intersperse plants that help the hop vines fix nitrogen from the air and soil. Third, you better love it, because the labor bill is not cheap. If conventionally grown hops require close attention, organically grown demand the doting, patient, tender loving care of a special needs child. The yards must be hand-weeded. They must inspected weekly if not more often for aphids, spider mites and mildew. As a rule, growing hand-crafted, hands-on organic means doubling your labor costs. Despite being a time-vampire, Gayle loves it. “I enjoy the learning process. 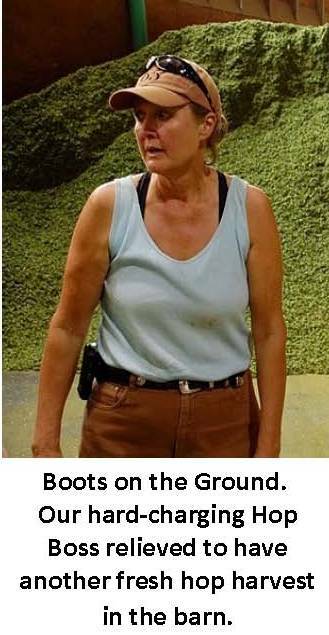 Right no w, we’re at the lower end of the learning curve, but we’re getting smarter.” She started planting 2 acres in 2008 and now has 7 acres in production. Her varieties have included Cascade, Fuggles, Willamette, Teamaker (a zero-alpha hop), Centennial and Liberty. Double Double, Toil and Trouble? Material costs are also about double for organic. Applications of non-synthetic biocides (e.g. soaps and plant based oils) are more frequent. The agents are “broad spectrum,” meaning they don’t zero in on a specific pest. To attract the good insects, as well as provide ground cover between the hop rows, Goschie Farms, is experimenting with integrating her yards with other flowering plants, like Elysium. It’s critical, Gayle says, to make sure the cover crop doesn’t block too much wind, which could create the kind of stagnant air pockets in which downey mildew thrives. At the ground level, she also plants clover, which attracts the good bugs when it flowers. Again, the trick is to diversify the plants so they flower at different times. In a sense, Gayle and other organic hop growers are boldly going where none has gone before. Unlike mega-crops like corn, wheat and soybeans, there isn’t a network of USDA extension agents standing by eager to assist in the event of an imminent calamity. There’s no manual for organic hop growers. They can’t run down to the feed store for a bucket of Monsanto-made smart bombs. Much of what they do is trial and error. They’re constantly tweaking and re-tweaking until they achieve some approximation of balance. It’s a game that takes time, resilience, and patience. For example, Goschie Farms, which specializes in aroma hop varieties, has also tapped into the power of aroma to control pests. Goschie has found success in using garlic and spearmint oils as natural weapons to limit unwanted pests by attracting their “good” predators. The thinking goes like this: if using crushed garlic can help control aphids in rose gardens by attracting aphid-loving ladybugs, why couldn’t it work with hops? Similarly, since spearmint oil has been used in vineyards to control spider mites by attracting predators like the minute pirate bug, why couldn’t it be used in hopfields? In both cases, the idea, converted to practice, has paid out small but important dividends. “Finding a balance intrigues me,” enthused Gayle, who’s clearly fond of the word “intrigue” . “That part, the learning part, that “Eureka” moment, when it all comes together, excites me. 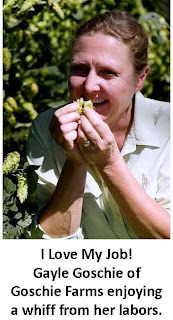 It has also made me a better farmer all around,” citing the fact that last year, in 2009, almost one-third of her 350 acres of conventionally grown hops were free of spider mite infestations. “What I learn from growing organically,” said Gayle, “I can also apply to my conventional fields.” Goschie Farms has long been a leader in growing hops in an environmentally respectful manner. Goschie was the first hop farm to be certified as “Salmon-Safe,” an endorsement which means it uses sustainable agricultural practices which limit the kind of unhealthy water run-off that imperils native salmon. As with its organic certification (from Oregon Tilth), Gayle sought the Salmon Safe approval not for economic advantage but because it was the right thing to do. Growing organically is, to be frank, no bed of roses. Despite big cash, time and brain power investments, the yield from organic hops for now continues to be unacceptably low. As a general rule, organic yields are about one-half the size of inorganic hops. Gayle is convinced that over time, as farmers build on their skills, develop better collaboration networks, and learn more about how to prime the hop’s nitrogen fixation pump, organic hop plants will get stronger and more vigorous. When they do, their yields will bulk upwards, as well. As for quality, the literature is virtually blank on any reported differences in the oil or acid composition of organic varieties. In the Garden of Eden, before the onset of synthetic pesticides, the fragrances and flavors emitted from a plant’s oils served to repel certain insects, fungi and diseases. Over time, as an organic hop ecosystem finds its equilibrium, one wonders what the future will bring. What oils will nature select for their survival value? What flavors and aromas will be associated with hearty survivors? We shall see. Just as growing big, bold, plump hop cones presents a challenge for the farmer, finding a market for organic hops also has its challenges. Under the current USDA rules on organic products, a brewer can market its beer as USDA certified organic even though the hops used are inorganic. The rule (section 205.606) has recently been challenged by the American Organic Hop Grower Association , which consists five growers. The group argues that since 2007, when hops were exempted from the USDA organic rules, there have been tremendous strides in the availability, quality and quantity of organic hops. Anheuser-Busch, which originally supported the hops exemption, has now written a letter advocating the removal of hops from the exemption list. The group makes the point that under the current regulatory scheme hop farmers are discouraged from growing organically since brewers can use inorganic hops but still legally market their beers as organic. They say the rules both stymie the farmers and foster dishonesty in the marketplace, as the only impediment to taking advantage of the loophole is a guilty conscience. Our decision to contract with Goschie Farms to grow 20 acres of organic Cascade and Centennial was made long before the AOHGA filed its petition to strike humulus lupulin from the exemption list. Our decision had nothing to do with legal loopholes and everything to do with advancing progress. We believe that Goschie Farms has the stuff and the spirit to set the standard worldwide for growing the highest quality of organic hops. It won’t be easy, but nothing that lasts is. There will be obstacles. Can we improve the yields in the next few years? Can we meet the needs of brewers for particular, perhaps unique, varieties in their beer recipes? Can we help expand the handful of brewers who regularly use bona fide organic hops in their bottled brews? Can we figure out how to reduce costs so organic hops can be priced competitively with their inorganic sisters? We are planting 20 acres of organic Cascade and Centennial hops in 2010 at Goschie Farms. We will be harvesting crops in 2012 and 2013. Call for more details. Go Big Green! The quest to breed more desirable aroma hops, aromas and flavor, oddly enough, has never really begun. While breeders like Dr. Al have hit home runs on crafting hop cultivars with more alpha, or higher yields, or disease resistance, few if any public breeding programs have made new and better aroma oils their holy grail. Until now. 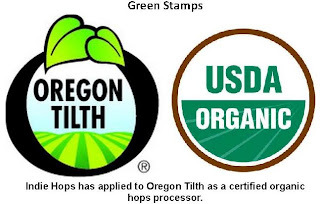 As we’ve reported, Indie Hops has sponsored a breeding and research program at Oregon State University which, for the first time, targets aroma hops. I spoke with Dr. Shaun Townsend, hops geneticist, about the new program that he’s pioneering along, along with his colleague Dr. Tom Shellhammer, a hop chemist. Is there a Super Aroma Hop Profile? The short answer, according to Shaun, is no. We can talk all day about total oils and specific oil compounds. But , but nobody really knows – largely because the research investment historically has been nearly nil—the association between particular oils (e.g., farnesene, linalool, humulene. Gerianol, citral, limonene, etc) and definable and discrete flavors (e.g., floral, piney, citrusy, spicy, herbal, etc). remains naggingly unclear. In contrast, Hhop oils, Shaun muses, are a more “complex beast.” Hornbook biology teaches us that the traits of a particular plant are influenced by genetics and environment. The exact contribution, however, is not well known. We know that soil, climate, pests insect invasion, and temperature are a huge influence, he says, but there’s a “gap in our knowledge” when it comes to connecting specific DNA sequences to specific oils that wind up in beers that register in our brains as having particular qualities. Do You Start with A List of “Super Aroma” Target Traits? These are decent guidelines, but under OSU’s new aroma flagship program, defining worthy traits is the domain of Tom, while Shaun will attempt to breed for those selected traits. To help identify the hops which may express desirable characteristics, Tom will be orchestrating hop sensory panels over the next few years. The panels will consist of experienced craft brewers, who will be asked to identify and describe flavor and aroma qualities of various hop brews. The data analysis from the sensory panels will be fed to Shaun, who will in turn cross targeted female and male hops for breeding, using conventional breeding techniques. Using Tom’s data, Shaun should readily identify the female plants. Choosing the male crossing partner, however, will be more difficult. Why? It boils down to who’s got the most accessible humulus lupulin. Females are teeming with it, but males – not so much. Their resin glands are much, much smaller, making it harder to harvest resin for analysis. “We aren’t exactly shooting in the dark,” assured Shaun. “We have several decades worth of data on breeding stock. Since males don’t produce cones, it will be harder to identify the best males with an optimal oil profile, but it can be done. Basically, if the oil profile from the progeny of a particular male is desirable, we can trace the genetic contribution back to the male partner. It just takes lots of sampling and testing.” And the patience of Job. Once seedlings are available, they are tested for Downey and Powdery Mildew and viruses. Weirdly-shaped, runty or puny “off-types” are culled out - the bad phenotypes. The vigorous chosen few are then transplanted to the field, where over a 3 to 4 year period they’ll be evaluated by the usual criteria (yield, disease resistance, appearance, size, etc). Can New Technology Speed Up the Selection Process? As we’ve learned from the People’s Hopmesiter, Dr. Al, the process of breeding, selecting, planting, harvesting, testing and releasing new hop cultivars can take up to a decade. Is there a short cut? The short answer, again from Shaun, is “yes” for mega crops like corn, soybeans and wheat, but a strong “maybe” for hops. The idea is to associate genetic markers with desirable traits (e.g., citrusy aroma). Once DNA sequences are mapped and understood, scientists could simply study the sample leaf tissue of seedlings for genetic markers (without destroying the plant). They wouldn’t have to wait for the 1 to -2 years it takes for females to yield plump cones before they could run their battery of tests. The technique, known as “Marker-Assisted Selection,” would allow breeders to plant hundreds and hundreds of female seeds, grow them into small plants, and pluck the leafs for DNA analysis. Using reliable molecular markers from seedlings to identify “home runs” would shorten the breeding program by many years, save tons of money and speed up the process of inventing new “designer” aroma hops. Of course, all of this is years away. But the journey has begun, thanks to the work of Shaun’s colleague, Dr. John Henning, who has been working on genetic markers, mainly for yield and disease reistanceresistance, at the USDA-ARS Hop Lab in Corvallis, Oregon for the better part of the last decade. Of course, we’ll still need to somehow associate particular DNA sequences with particular flavors and aromas, a herculean task further complicated by the changes a hop undergoes during its life and brewing cycle, depending on the terroir and brewer. Dr. Townsend is like a kid in the candy store. “I’m very excited about the program, “ he said. “There’s so much to love about beer and hops, but there’s so much we don’t know.” Shaun is optimistic that with the data from Tom’s hop sensory panels, he can ramp up the process of selecting female and male partners for crossing, the results of which can be tested later on down the road.. The OSU breeding program is as big and bold as the richest pale ale. Instead of delivering one thing – more alpha acid – OSU’s finest aim to unlock the hop oils treasure chest. Tucked away in each pouch of mysterious humulus lupulin, there are as many potential flavors and aromas as there are human moods, temperaments, and personalities. This is the start of a brilliant new beer world in which brewers will be free to cook up a diverse roster of beers showcasing endless combinations of new and dazzling aromas and flavors, limited only by the imagination. Columbia, not to be confused with the super alpha Columbus, is your proverbial hop diamond in the rough. Released to the public in 1977, this aroma cultivar has never found it’s niche in the marketplace. 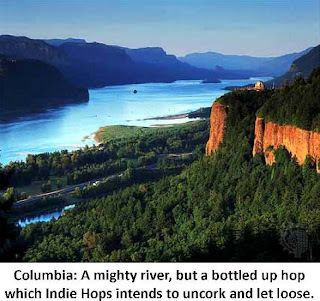 Like it’s namesake, the mighty Columbia river, we think Columbia is indeed a mighty hop, but it’s potential has historically been dammed up or drowned out, ironically, by the super star status of her big sister: Willamette. An Internet search yields little reliable information on Columbia, for good reason. The BA hop usage data shows that zero pounds of Columbia were used by crafties in 2009. The reason for that is simple: crafties don’t know much about it, merchants aren’t endorsing it, and farmers without forward contracts simply aren’t growing it. Indie Hops intends to revive this long-buried, unheralded but busting-to-break-out aroma hop. We’re planting several acres this year on the verdant Goschie Farms in the Willamette Valley, where, you’ll learn, the seeds were literally planted, harvested, brewed and promptly scuttled over three decades ago. We believe that but for the snout and cloud of one very powerful brewer more than 30 years ago, Columbia today could easily share the leading role with her ballyhooed sister, Willamette. In 1967, our eager young hopmeister Al Haunold was charged with the task of breeding a new Fuggle-like hop, to replace the old English Fuggle hop, which had not produced well in Oregon. At the time, Cluster was all the rage in Washington, and Brewers Gold was the market leader in Oregon, as both generated hefty yields. Industrial brewers at the time (you know: Strohs, Schlitz, Pabst, Falstaff, Rheingold, Anheuser Busch, Miller) were having trouble securing reliable supplies of imported Fuggles from the UK and Slovenia. (As a sidenote, many moons ago Fuggle had been transplanted to Yugoslavia, whence it emerged as the hop marketed today under the name “Styrian”). In the USDA greenhouses at Oregon State, Dr.Al succeeded in doubling the chromosome number of the original Fuggle to create a tetraploid Fuggle hop, which was identical to the original Fuggle (is there anything this man can’t do?). He then crossed this tetraploid with an open pollinated male Fuggle seedling, one teeny-tiny hop flower at a time, deftly wielding a Q-tip to pollinate the male (picture Geppetto breathing life into Pinnochio). 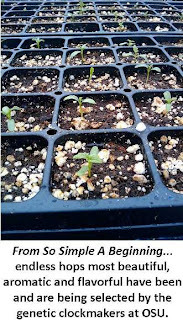 In the year (1968), the master hopcrafter germinated the seeds, strung the tiny plants in the greenhouse, and obtained about 1000 healthy potted plants, the following year were moved to the field. After a few years of testing small samples, Dr. Al selected the six most promising genotypes (all obtained from the original Fuggle) and submitted one pound bale samples for test brewing. The new hops were brewed and presented to a taste panel consisting of about eight brewers from Anheuser Busch, which back then was big but not yet ginormous. The selected “Fugglish Six” included what later became Willamette and Columbia. The AB taste panel overwhelmingly preferred Columbia. The hop cultivar had higher alpha acids than Willamette (8-9% vs. 6-7%) and a higher production yield. But it was also higher in Co-Humulone (36-40% vs. 29-32%), registered a higher H/C (humulene/cryophyllene) ratio in its oil and matured 4-7 days later than Willamette. Enter Frank Schwaiger, AB’s German-born master brewer. “Frank was amazing,” recalled Al. “Before instruments were readily available for measuring alpha acid and oil components, Frank had developed an incredibly keen sense of aroma and flavor.” Dr. Al credits Frank with catapulting AB from the back of the pack to its current leadership position. What was going on here? Was aroma the deciding factor? Both offered mildly fruity and earthy aroma. Or, as a sign of things to come, did Frank pull Willamette through because it was lower in alpha acid, and thus thought to be less bitter? We can only speculate. So that’s what we’ll do. 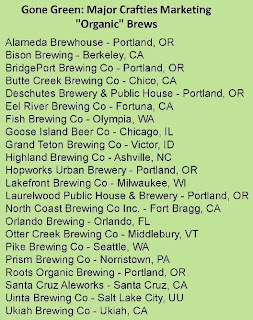 However, before doing that, Al wanted the record to be perfectly clear – Willamette was (and is) one helluva hop. He proudly remembers what Frank told him years ago: “Willamette,” Frank thundered, “is the closest to the original Oregon-grown Fuggle of any other hop I have ever tested.” High praise indeed and well done young Al. Back to the story. Now, at about that time, the industrials were trending towards lighter beers that promised not to offend the average consumer, who was sought to actually prefer coca cola (sweet) to beer (bitter). In the 1970s, the bittering units of popular beers hovered around 14 IBU. Today, the global market is demanding hopped-out beers that average below 9 IBU, a level which is on the cusp of being “undetectable” or below the flavor threshold. Perhaps Frank saw the future, a future in which the most profitable beers contained the least amount of hops and malt. Instead of targeting connoisseurs, maybe he envisioned targeting a dumbed down mass audience with a beer-flavored beverage that would be served at super cold so as to numb the taste buds to whatever hop bitterness managed to sneak through. Maybe Frank detected more bitterness in Columbia. At the time, before the advent of High Pressure Liquid Chromatography (HPLC) in 1979, Frank probably wouldn’t have known that Willamette had a lower CoH than Columbia. Cohumulone, once boiled and converted to iso-cohumulone, is thought to contribute mightily to the finished beer’s bitterness. Perhaps, with his refined snout and sensitive tongue, Frank sensed Willamette would better serve a consumer market attracted to low to barely detectable bitterness in their beer. In any event, you’ll notice that it was a Behemoth Brewer who decided the fate of Al’s little green creations. Would a wine connoisseur let Ripple decide what grapes to grow? The criteria for hop selection are completely different. The biggies want processed alpha acid extracts for the most part, the hand-crafties want beer with flavor, aroma, nutrients, color and body. In the late 1970s, AB contracted with Goschie Farms in the Willamette Valley to grow a few hundred acres of Columbia. When Frank picked Willamette and doomed Columbia, AB ordered Goschie Farms to destroy all of those lovely hops. None came to market. Fast forward to 2006. AB again approached Goschie Farms to experimentally grow several varieties, including Columbia. Goschie dutifully and eagerly planted 30 hills of mighty Columbia rootstock. But, as fate would have it, Columbia never found the open waters of the marketplace. AB sold out to Belgian InBev, who decided to shut down the experimental plots, again dooming Columbia back to gather dust anonymously in the USDA Germplasm Repository (where hop germplasm is catalogued and stored). Indie Hops heard the story and shouted from the Hoptops: Set Columbia Free! We took an interest in the unsung Fuggle hero instantly, asking ourselves: Why should the fate of a perfectly good US Fuggle Aroma Hop, bearing the pixie dust of the vaunted hop magic man Dr. Al, be decided by one man at Anheuser-Busch? 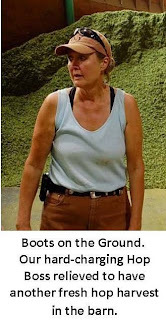 Gayle Goschie went out to her experimental acreage and, as luck would have it, found a few hearty Columbia survivors, begging for a chance to get into the game. We are excited to revive the abandoned but not forgotten Columbia. Goschie Farms, Oregon’s first hopyard to obtain “Salmon Safe” certification, is the perfect place to let Willamette’s unknown but potent little sister run free.